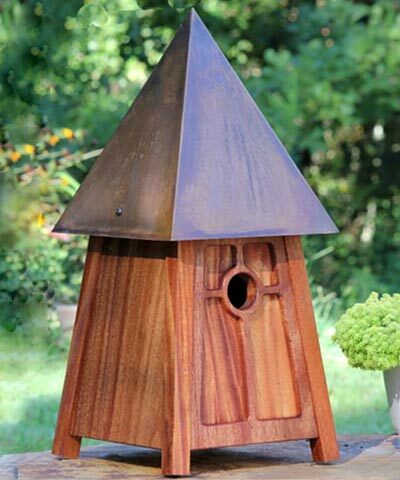 Add your appreciation for fine architecture to your love of birds using the Heartwood Mahogany Mission Melody Bird House. A significant, burnished copper roof and mahogany body form a truly beautiful house, bringing a luxurious feel to your backyard. The square sides of the home angle outward, and four legs allow the item to rest on a level surface. For added versatility, use the included mounting plate to secure this home to a 4 x 4 post. An inset panel on the front of the home evokes a large window, and the 1.5" diameter entry hole rests in the center of this recess. Raised wooden bars surround the entry hole, further framing it for a hint of the Arts and Crafts architectural style. The wide base of the piece offers plenty of room for a bird family, and drainage here helps the nest remain dry. Ventilation gaps beneath the large roof help maintain the interior temperature, and a copper disc on the back removes for cleaning the unit. The mahogany home and copper roof will both age wonderfully outdoors, and the brown hues enhance the natural beauty around the piece. Listen to your feathered friends sing the praises of their new home when you place this Mahogany Mission Melody Bird House in your yard. Made in the USA.